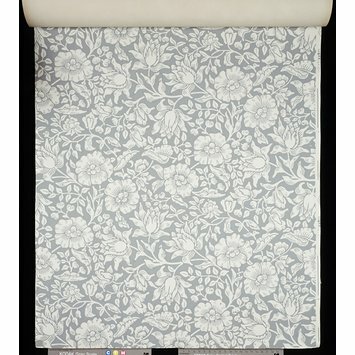 Specimen of 'Mallow' wallpaper, a floral pattern of (? )mallow flowers and foliage; Colour woodblock print, on paper; Inscribed on the back in ink with title, number and price. Part of a pattern book. Inscribed on the back in ink with title, number and price. Given by Mr Allan F. Vigers. 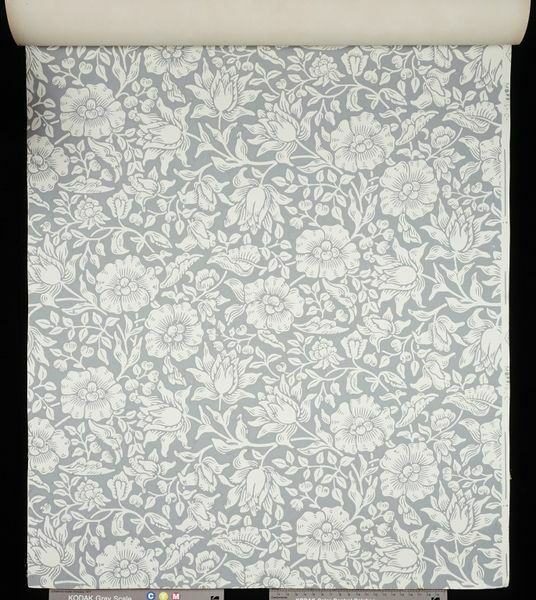 Specimen of 'Mallow' wallpaper, a floral pattern of (? )mallow flowers and foliage; Colour woodblock print, on paper; Designed by Kate Faulkner; Published by Morris & Co.; Printed by Jeffrey & Co.; Part of a pattern book of Morris & Co. patterns (E.633-858-1915); England; 1879. Clark, Fiona. William Morris Wallpapers and Chintzes. New York. 1973. Greysmith, Brenda. Wallpaper. London, 1976. Victoria and Albert Museum, Department of Engraving, Illustration and Design, Accessions 1915, London: Printed under the Authority of His Majesty's Stationery Office, 1916. Part of a pattern book of Morris & Co. patterns (E.633-858-1915).